Hey folks, normally I would put out a very thorough 45 min – 1 hour lesson (as I do every Friday), but due to the launch of the new ActiveMelody website, I was just too swamped to get the lesson complete in time. However, I didn’t want to leave you with nothing at all! So I put together a really simple little video that shows you how to play a fun little blues rhythm that can easily be transposed to any key. There are no open strings in this one! I get emails from people all of the time asking for ideas on how to improve their rhythm playing. It’s very easy to get into a rut when playing rhythm (maybe even easier than when playing lead). So this video serves as another concept that you may or may not be familiar with. It’s very similar to the melody line in Muddy Water’s, “I’m Ready”. I should also mention that this works great on acoustic or electric guitar. Awesome! Can’t wait to work on this! Thanks Brian! Yep! That looks fun Brian, new site is awesome! Hi Brian, Greetings from France and “felicitations” on your new web-site. Active Melody has come a long way from its somewhat humble beginnings, thanks to your talent and hard work. I wondered if there was a tab for your simple blues rhythm? Unfortunately I didn’t create a tab for this one, just the quick video. Great lesson, short and sweet, but valuable in helping me feel comfortable in trying to play something without having to memorize the road map. Thanks Brian. Thanks, Brian, very cool! That was the first formal blues I learned, slightly different accents, but that’s it. There’s another subject that I’d like your help with, or maybe someone else on the site has some experience with tuning to compensate for the differences between open and fretted notes. There’s always the factor of attack when it comes to pitch. My problem is if I get my guitar in tune at the fifth fret, the open strings aren’t entirely harmonious, things like that. Are there different methods/”tricks” for tuning for different keys? One thing that helps me tune is knowing that the harmonic on the fifth fret is the same tone as the harmonic on the seventh fret on the next higher fret. For example, the fifth fret harmonic on the low E/6th string is the same tone as the seventh fret harmonic on the A/5th string. But that doesn’t solve the problem. I suspect some pros have their little nudges for each string in different keys. Would anyone care to confirm this and share them? Thanks! CORRECTION: I used the wrong word. Write twice, read twice, submit once. Oh well. The capitalized word below is the one I should have used. One thing that helps me tune is knowing that the harmonic on the fifth fret is the same tone as the harmonic on the seventh fret on the next higher STRING. For example, the fifth fret harmonic on the low E/6th string is the same tone as the seventh fret harmonic on the A/5th string. What I’m looking for is some kind of “sweet” compromise, if you know of one. Depending on string height at the nut and intonation at the twelfth fret there will be some discrepancy between a fretted note and an open-string note. To me, it becomes more obvious on an electric guitar than on an acoustic one. It’s like the acoustic has a lot more over-tones going on, and so sort of “masks” the problem. Also, my Strats are more prone to this than my LP’s. So, what to do? I would say give the guitar the best set-up you can accomplish, yourself or via a tech. If it’s still a problem, then maby it’s time to try out an Earvana-nut. I put that into my Strats years ago because this problem was driving me nuts. pun intended. I will say, however, that part of the problem could go away with practise. As my hands get more comfortable around the guitar neck, my guitars seem to improve intonation-wise. Go figure…. Hi Montego, thanks for your thoughts. I know some of it is finger pressure, so if I’m playing a lot and in the zone I’m probably correcting for it that way, just responding. I’m still wondering if there’s a formula, like “X cents flat” (or “X cents sharp,” just examples), or using fretted notes for both notes (say 1 and 6 fretted instead of open and 5). I usually play acoustic, so I’m not aware of the comparison you made (even the Guild hollow-body, I play without amplification). I just bought a Tele (in June) so I could bend notes, but it’s such a different instrument from every other guitar I’ve played, it’s taking some time to get used to it (plus, since I live in an apartment, I’m using headphones, which are far more unforgiving than an amp). If you’re using harmics string to string to check if one string is in tune to the adjacent string I assume you’re not using an electronic tuner? If not, get one quickly lol. Hello Bruce and great work on the new site. I can’t imagine how you get all this done and at the same time providing all the brilliant content. The lessons are simply the best and I really love the site. For those who haven’t yet become premium members, please don’t wait. You get so much for the money! 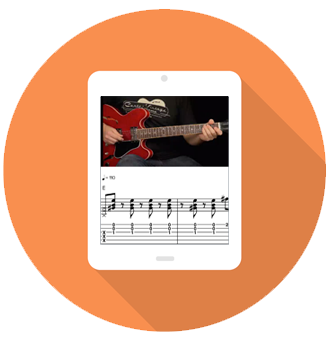 This mini lesson is a lot of fun and almost anyone can play it. So, thanks Brian, and keep up the good work! thanks! this is a great lesson. It now seems so obvious how you play rhythm and then throw in lead,, call and response as you say. But I did not understand this for years and years. I could kinda do it fingerstyle in the first position,,, but never was any good at doing it up the neck like you have taught in 114 , and some this one etc. this has been a real eye opener. I almost always play by myself, I only play out at art fairs and in front of some antique stores up in Houston, and this is exactly what Ive needed.